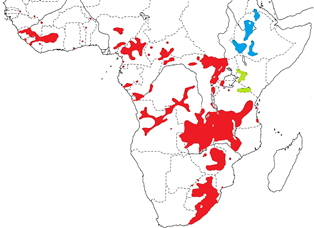 The Red-collared Widowbird Euplectes ardens is a widespread widowbird in Africa, being found from Senegal across to Ethiopia and south to eastern South Africa in the localities shown on the map below (based on Birds of Africa). It occurs in a variety of habitats including grassland, rank vegetation, cultivated areas, and slopes with sparse trees. 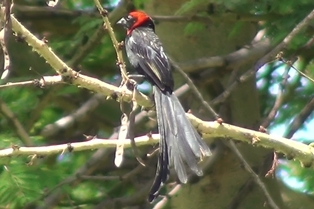 suahelicus, found in the highlands of Kenya and N Tanzania (green on map); the male has a red collar, and varying amount of red on the head (above right). 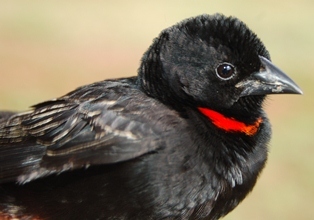 The Red-collared Widowbird feeds on seeds, insects including termites, nectar. It forages on the ground, often in flocks of 200 birds or more. This species is polygynous and territorial. Males with longer tails attract more females and males with larger red collars held larger territories. Males prefer hillsides, where they can glide downhillfor display flights. The nest is an oval structure with a side entrance, built by the male and lined and strengthened by the female. A male may have 3-22 nest structures placed in tall grass, on his territory. The eggs are grey or blue-green and heavily speckled with brown, often forming ring near the thick end (see photo at phown 2411). There is one PHOWN record for this species, and a news item described this record from Nairobi (phown 2411). Many more records are needed of this common species, although nests are well hidden. Submit any weaver nest records to PHOWN (PHOtos of Weaver Nests) via the Virtual Museum upload site. More photos of this species may be viewed at Birdpix.